TAIPEI (Taiwan News)—Have a hard time finding true love? Maybe you should try a mailbox in central Taiwan, which looks like one of the mailboxes you see on street corners but functions very differently as it was especially erected for the purpose of matchmaking. Walking in Dadun 19th Street (大墩十九街) in Xitun District, Taichung City, visitors will be able to see a big red mailbox standing on a quiet lane. The ordinary looking mailbox is not a Chunghwa Post mailbox, so the letters you drop in will not be sent to the addresses on them. Instead, the mailbox is a matchmaking mailbox that only accepts letters that ask for help from Yue Lao (月老), the god of matchmaking. The matchmaking mailbox accepts letters seeking true love all year round. 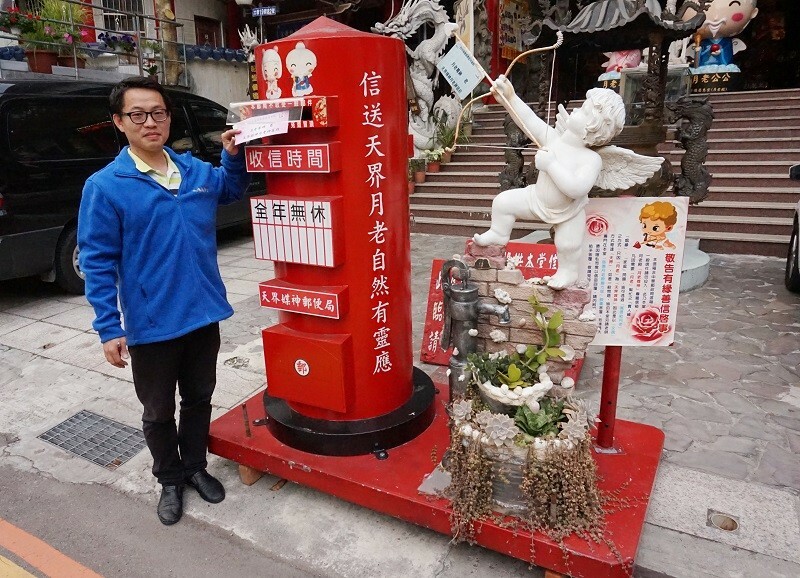 The matchmaking mailbox is a facility of Ci De Ci Hui Tang (慈德慈惠), a temple originally dedicated to worshipping Guan Gong, the Chinese God of War, as well as a goddess. According to temple abbot Chen Rui-bao (陳瑞寶), a Yue Lao hall was added to the temple in 2003, and since then the hall has become a popular place for believers coming to seek help from Yue Lao. Every Saturday, the temple arranges a “Yue Lao Master” to answer love seekers' questions and provide them consultation. As a way of going along with increased environmental awareness, the temple set up the Yue Lao mailbox in October last year to encourage believers to write letters as a way of sending messages to the god, instead of burning joss paper, according to Chen. The temple collects the letters every Saturday and gives them to the “Yue Lao Master" to read, Chen said, adding that general questions will be answered on the temple’s Facebook page. Chen said that the temple receives an average of more than 30 letters a week, and Yue Lao in the temple has successfully helped a few believers find their life partners, adding that some believers had written letters to the temple to thank the matchmaking god for helping them find their true love.